Introduction: Resection of manubrium or body of the sternum is associated with a necessity of chest wall reconstruction. 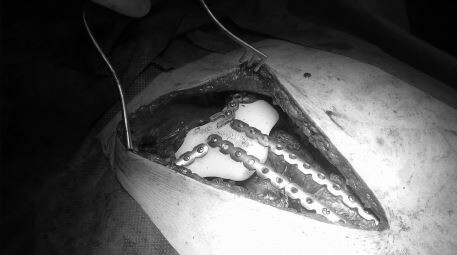 Large sternal defects require the use of different types of implants to ensure acceptable esthetic effect for the patient and chest stabilization. Aim: The purpose of this case report is to present a novel method of reconstruction of manubrium removed due to renal cancer metastasis to the sternum. Case: We present the case of a patient, who had underwent right nephrectomy for clear cell kidney cancer, diagnosed with a metastatic tumor in the sternum resulting in destruction of manubrium. The patient undergone tumor resection with primary reconstruction with an individual prosthesis. Sternal defect was filled with a personalized, computed tomography scan-based 3D-milled implant made of polyethylene. Results: Sternal reconstruction was uneventful. The patient endured surgery well, and has been under surveillance in outpatient clinic, without any respiration disorders, implant movement or local recurrence. Conclusion: Custom-designed sternal implants created by 3D technique constitute an interesting alternative for previous methods of filling defects after resection of a tumor in this location.